There’s a lot to consider when creating a content strategy in 2019. Not only is there more competition than ever online, but there are so many types of content and ways to reach your target audience. Do you start a blog? Do you podcast? Should you focus on research studies or whitepapers? How do you really know what to do? But before you do anything else, you need to define what goals you want to accomplish with your content. I’ve written previously about the importance of having an audience-focused content strategy before — and it’s still relevant. Every single piece of content you create needs to be mapped to a goal, otherwise, it’ll leave your audience wondering why they should care and what to do next, assuming it even reaches your target audience at all. But the work doesn’t stop there. Once you have your goals and your brand’s unique angle nailed down, you’ll also need to prioritize your means of content distribution. This is especially important if you’re just starting out — you should zero in on a few key distribution channels and master those before you expand into others, or you risk spreading yourself too thin and sabotage your chances of success in any of them. This post will help you zero in on what distribution channels make the most sense for your goals, and how to create content that will perform well in them. If you’re a new brand or a lesser-known brand in your vertical, it’s crucial to expose your audience to your brand and demonstrate how it can solve their problems. There are many distribution options for brand awareness, and they all involve using external platforms in some way to help you connect to a larger audience of people. If your brand publishes a large volume of daily content that covers broader, news-worthy topics, content syndication can be an effective way to get your brand in front of a new audience. I work for a new affiliate marketing venture called The Ascent by The Motley Fool, and our coverage of broad, personal finance topics makes us a natural fit for content syndication. From Flipboard to Google News, major news outlets are always looking for money and finance-related content. Even though the SEO value is limited for content syndication, as links are typically no-followed, this is still an effective way for us to fulfill our brand awareness goal of reaching a wider, qualified audience. Just be sure any syndication partners will provide a canonical tag back to your site to ensure you don’t end up with duplicate content issues. The Fractl team did an impressive piece about understanding the networks of news syndication if you want to learn more. Content created for syndication typically has a timely slant to it, as that’s what major news outlets are looking for from syndication partners. Whether it’s a finance topic related to an upcoming holiday (i.e. 7 Personal Finance Lessons Learned in 2018) or something happening in the news (i.e. How to Financially Prepare for the Government Shutdown), it needs to be a gripping headline with information valuable to a reader today. It also needs to be quality content, free of errors, and not miles long. Answer the headline entirely, but eliminate the fluff. And don’t forget to include relevant links back to your site, so you can get this larger audience to visit your website. If your own website doesn’t have a great following, engaging in sponsored content on a more prominent website can be valuable for building brand awareness. The type of sponsored content I’m referring to here is online advertorials or articles that look like normal articles, but are tagged as “sponsored content,” typically. Because visitors can see that this content is “sponsored,” they are naturally more skeptical of it — and rightfully so. To create a quality native advertising piece, you’ll want it to be genuinely helpful and not overly promotional. It’s already clear it’s a promotion for your brand, so the content doesn’t need to reinforce that further. This above example clearly does not take itself seriously. It provides a quiz that is on-brand with what a BuzzFeed visitor would expect and want to see. 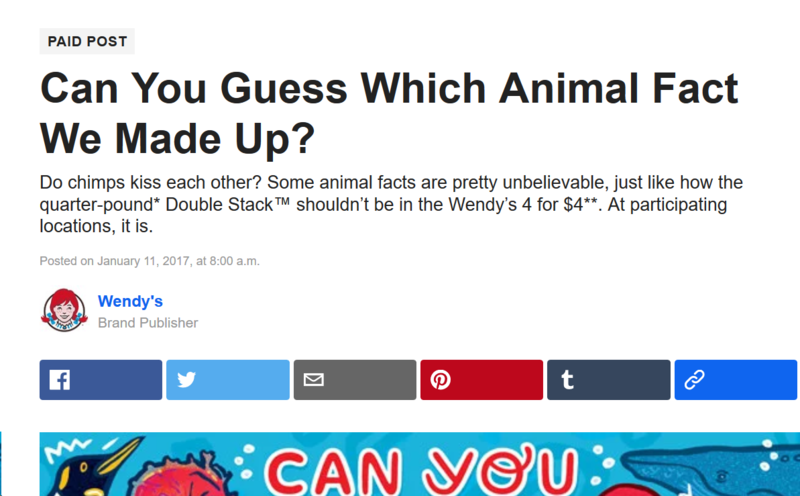 There’s no overt promotional play for Wendy’s in the quiz. If you don’t want to pay for a sponsored content spot on another website, you could also look for relevant sites that take guest posts. This post you are currently reading is an example of that: I’m not paying, nor am I getting paid to publish this post with Moz. But, I am getting more brand exposure for my team and myself. And Moz is getting unique content with a fresh perspective. If you do pitch a site for a guest post, make sure it’s compelling and in line with what their audience wants. Keep it helpful and not promotional. You will need to establish trust with this new audience. One of the big advantages of utilizing paid advertising is that you can see results right away and get your content in front of a qualified audience, whereas, organic takes longer to see growth. To get your content to perform well in paid search, it’ll need to be more niche and targeted to the keywords you’re bidding on, otherwise, your quality score will suffer. Google, Bing, and Yahoo all have their own forms of a quality score that takes into account a number of factors, including your expected CTR, landing page quality and relevance to your ad, and ad text relevance. This might mean you’ll need to develop more landing pages to cover your topics than you would for a page created for organic search. That’s not an issue from an SEO perspective as long as you no-index your landing pages. 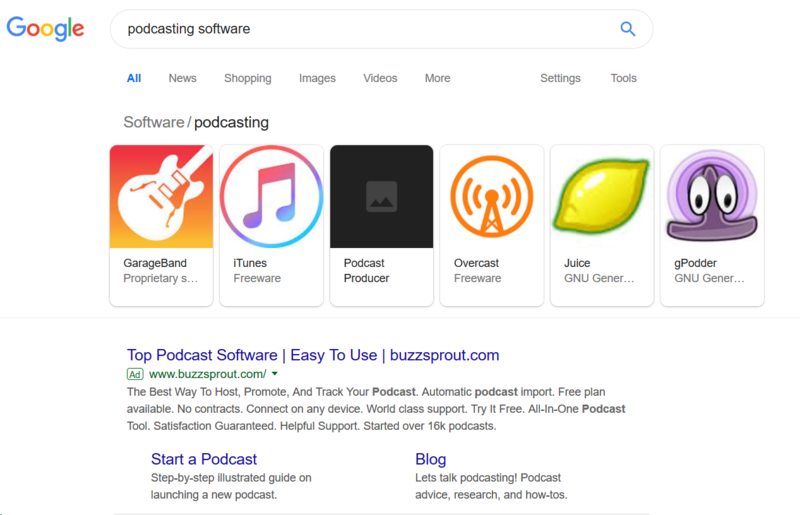 For example, the query “podcast software” gave me a really relevant ad for Buzzsprout.com, not only using my keyword in the ad but also providing relevant extended links below. Once on the landing page, it also gives me exactly what I’m looking for. The language varies slightly to “podcast hosting,” but it clearly answers my intent. Similarly, both Facebook and Twitter have a ‘relevancy score’ that acts as the quality score. These social platforms are measuring your expected engagement rate with an ad, which indicates how well your content matches the needs and interests of the audience you’re targeting. What this means is that, like with paid search, your content needs to be more niche and customized to your audience for higher performance. Organic traffic is often an appealing distribution method because prospects qualify themselves through their relevant search queries. Not only do you want to have targeted content for key search queries, but it is also important to build domain authority by acquiring relevant, authoritative external links. For this, I have included two important tactics to achieve better results organically for your brand. Blog posts are among the most common ways to rank well in organic search and acquire featured snippets. My team has almost exclusively been focused on blog articles up until this point, as it’s relatively easy and efficient to produce at scale. The key to successful blog posts is to have a targeted topic informed by keyword research. The Moz Keyword Explorer or SEMRush Keyword Magic Tool are great places to find topics for your blog posts. I have found both with The Ascent, as well as in my previous role at Kaplan Professional Education is that having blog posts that target specific long-tail keywords tend to perform better, and are more likely to pick up a featured snippet. However, the best way to know for your vertical is to test it yourself. In my experience, writing using the inverted pyramid technique works wonders for featured snippets. Answer the query broadly and concisely at the beginning of the article, and then dive into more details further into it. It’s a technique from journalism, so readers are used to it and search engines seem to really take to it. If acquiring external links is one of your SEO goals, conducting original research can be a powerful tactic for achieving success. What makes original research so powerful for link building is that you are the only source of your data. If you publish data that is unique to your organization or conduct your own survey or focus group and report the findings, it provides new data with unique insights to glean from it (assuming your methodology is solid, of course). Here is a great example of original research about how frequently brands produce original research (how meta!). It also provides great data on types of original research brands do if you want to learn more. This original data came from a survey of 700 marketers, and it worked. It got linked to by all kinds of prominent industry blogs like Search Engine Journal, Content Marketing Institute, Orbit Media, and now, this one too! If you don’t have any data that you can or want to publish from your organization directly and you don’t want to conduct your own surveys, there is also the option of mining official sources in your industry (government or census data work well in many cases) and finding a unique take and interpreting it for your audience to understand. Often, there is rich data buried in technical jargon that people don’t know about, and your original perspective can add a lot of value to your audience. For example, my team published this secondary research during the government shutdown in January. All of the government data in this piece is accessible to anyone, but it’s time-consuming to find and difficult to interpret. Our writer’s original take on it surfaced important insights that journalists incorporated in their shutdown coverage. Remember: Putting your own research out there won’t necessarily acquire links on its own. Even if you are a well-known resource, your efforts will be better served with outreach to relevant journalists or bloggers. If you’ve got the resources to dedicate to outreach, or the ability to hire an agency to help, this can be an extremely effective strategy that can help to build the authority of your entire site. If generating leads is your goal, your content will need to be compelling enough for a prospect to give you their contact information. They know what’s in store for them by giving you their email or phone number, so they won’t sign themselves up for marketing messaging for just average content. Although we just talked about original research for link acquisition, original research can also be an amazing way to generate leads if you want to put your research behind a sign-up wall. While the basic principles remain unchanged, find a topic you can create a unique study on, and execute it using a solid methodology. You should focus on the prospective leads you are trying to attain and create a research study or whitepaper that is irresistible to them. What do you wish you had known when you were preparing for the licensing test? What advice do you have for new professionals? After gathering over 100 responses, I extracted the data and grouped them into themes, pulling direct quotes for future insurance professionals. This is still successful lead gen content because it’s evergreen — it tells real stories from real people who have gone through the licensing process and started a relevant financial career. Prospective students can better understand what they are getting themselves into. At the time, this kind of advice from so many qualified professionals didn’t live anywhere else, making the e-book exclusive content. Qualified prospects were willing to download it for it’s exclusivity and saving them the time of having to conduct multiple informational interviews. Ideally, when you have lead gen content, you’ll want all of your free content to naturally lead into a call-to-action for your whitepaper or e-book. That way, any traffic that you attain through organic or paid advertising will naturally flow into the download. Creating a pitch at the end of your articles is a good habit to get into, as well as linking within your articles as appropriate. It’s also a good practice to only ask for the minimum amount of contact information that will allow you to market to these leads. If you plan to send them emails, only collect their email address, for example. The more information you require, the lower your conversion rate tends to be. Webinars that provide informative content for prospects can be an extremely effective medium for lead generation, particularly if you are using visuals to help explain concepts. The “in person” element also allows prospects to build a relationship (or the illusion of one) with the presenter(s) because they can hear and see the speaker live. You can also play up the exclusivity angle with webinars because the content is only available to those that choose to attend. Similar to e-books and whitepapers, you’ll want to collect the minimum possible amount of contact information on your sign up form. If you only need an email address or a phone number, stick to that. The more you ask for a life story, the fewer sign-ups you’ll receive. Of course, any content program’s ultimate goal is to drive revenue. Content that leads to conversion directly, though, is often not given as much attention as some of other forms of content. Regardless of whether you sell your products online or not, your product pages on your website should be focused on driving action to purchase. To do this, you should keep your pages simple. Each product, no matter how similar, should have a unique product name and description to keep you clear of duplicate content issues. Focus on what the product is and how it will ultimately improve the life of a customer in a brief description. Bullet points in the description help the user scan and digest the important features of the product. Ian Lurie at Portent recently wrote about utilizing Amazon Q&A to inform what common questions people have about your product, and answering those in your product page bullet points. If you can do that, that’s a winning formula. Include images of the product, and if necessary, video too for a more holistic view of the product. And add a trust signal. Common trust signals include reviews, a customer quote, or a statistic about how the product helps customers. Most importantly, you need a prominent, clear call-to-action. It should stand out, be above the fold, and have clear language about what will happen in the next step. Trust signal – ie. a quote or review, statistic, etc. Of course, these are just some of the most common goals I’ve seen in content strategies — there’s plenty more goals out there. Same goes for types of distribution for each of these goals — I’ve only scratched the surface. But if I listed out every possibility, you wouldn’t have made it this far through the post! Do you agree with my points? Do you have other tactics that work for any of these goals? What different content goals do you have if they weren’t mentioned? If you’ve got other suggestions or ideas, I’d love to hear them in the comments!